I wrote 3000 words today! That's top form for me. I did it by writing for one hour first thing in the morning before the children got up, and then by doing housework until one in the afternoon when I sat down for my usual writing time. Writing a little extra in the morning got my brain chewing on the next scene, and by the time I'd cleaned and vacuumed the upstairs I was ready to sit down and let it all pour out. So who is up for test-reading? I know it is the busy holiday season, but hey, you need to take a break now and then, right? Writers need patience when they first start out. When you write your first story, hey, that's great! You're on your way! Now, go write five whole books, pour sweat, blood, and tears over them until they're the very best they can possibly be, and then put them all in a box in the garage because only now are you ready to write something worth publishing. Writers need patience when they finally get to that book that's going to be the one. Books are like delicate little plants growing in a greenhouse in early spring. Send them out too soon, send them out before they're ready, and they die. It is so hard to wait, so hard to do one more revision, so hard to think it all through and think it all through again. But, with time, the ideas grow stronger, the characters grow stronger, the story grows stronger. Writers need patience when the time comes to submit. Researching agents and editors, preparing query letters and synopses, all of this takes time away from writing. And then the waiting. The eternal waiting. Six weeks, eight weeks, three months... yes, you can draft a new novel in the time it takes to hear back on a submission. I know. I've done it. Writers need patience as their agent or editor asks for revisions. I have a friend who was asked to do four re-writes before signing a contract, and then another four re-writes after. It takes years, years upon the years already spent in learning the craft, to create a book and get it ready for printing. So the next time you hold a good book in your hands, think of all the patience that went into it. Today I'm drafting a new ending for my science fiction novel. I don't know how people used to write science fiction before they invented the internet. Right in the middle of a paragraph I can open up a window and in a few clicks I have several newspaper articles about actual hostage situations to read, plus a chart of the international radiotelephony spelling alphabet. I've been trying for six years now, and I have not yet been able to grow a tomato in Henderson, Nevada. This week I checked on the internet and found out that tomatoes don't like temperatures colder than 53 deg. F or hotter than 95 deg. F. That means the only time tomatoes would be happy here would be for about one day in April and then maybe one week in September. 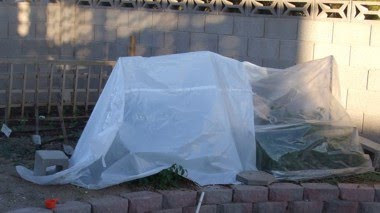 So, even though it is nowhere near freezing at night yet, I go out and cover up my tomatoes every evening. They seem to be enjoying it. In fact, I think some of them are getting ripe, even though it is already the middle of November. I couldn't get gmail to work on my computer this afternoon. Firefox kept telling me the site wasn't secure. Baloney! I uninstalled Firefox and tried again, just in case something had gotten buggy. It still didn't work! Even with a fresh, newly down-loaded version of Firefox. www.google.com uses an invalid security certificate. The certificate expired on 3/27/2010 3:20 PM. "Expired in 2010? It hasn't expired yet! What's it talking about?" I asked. My husband suggested, "Looks like we have a problem with the computer's internal clock." "Oh!" I moaned and buried my face in my hands. "That's it! I set the date to June 2086! That's when my book happens, and I wanted to know what dates went with what days of the week." So if I didn't answer your e-mail today, it's only because I left my computer 77 years in the future.